One of the first movies I ever saw–which is still one of my favorites–was on television just the other night: The Great Race (1965) with Tony Curtis. My Dad took me (just me!) to the movie in a big old theater in midtown Memphis. It’s a silly and funny movie, and just plain fun. There is one scene where the characters get into a huge food fight and Tony Curtis (The Great Leslie) strides down the center of the room with cake and icing and all colors of things flying everywhere, and not bit of it hits him. This was in the days before all sorts of special effects and I was captivated by that scene. I think Daddy was, too. Our whole family went to see Gone with the Wind (1939) downtown when I was around twelve years old. I can’t remember why, but for some reason the film had not been shown in years and so it was a big deal to go see it then. That’s another movie I love to watch again and again. I think it’s when I first realized how important my “Southern-ness” was. 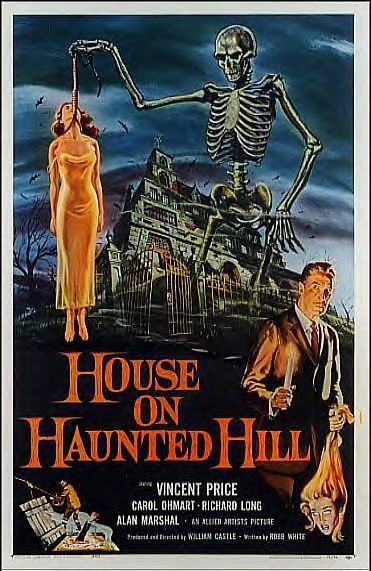 My favorite movie in those days, though, was the early black-and-white version of House on Haunted Hill (1959). I think I was about six years old, and Daddy took me to see it because I begged him to. I recall getting dressed up to go and Daddy wore a suit and tie; going to the theater felt like a major event. After seeing House on Haunted Hill, I was terrified for months afterward. I remember in the movie there were acid pools in the floors–someone would fall in, and then their skeleton would rise to the top. In some rooms, blood dripped from the ceiling onto someone’s shoulder and they would scream … and so did I. In another room, the walls started closing in and I assume people got squished. I’m sure I had my hands over my eyes. I could hardly sleep after that one. 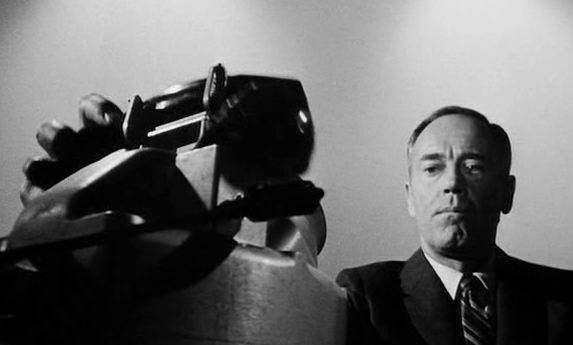 One more film that has stuck with me for many years–and I saw this one recently on television, too– is Fail-Safe (1964), about the atomic bomb. I’m starting to wonder why my mom didn’t go to the movies with us … Daddy took my two sisters and me to that one, too. The theater we went to in order to see Fail-Safe is actually now a nightclub in the University of Memphis area. In this case, I am sure Daddy was really the one who had wanted to see this movie, because (A) we had no idea what was going on throughout the film, and (B) we were bored to tears. I am sure there was quite a bit of whining from us and plenty of “shushing” from Daddy until it was finally over. Anne Swearingen holds BA and MA degrees in journalism and is the director of creative services for a national consulting firm. Though she sees fewer movies today than she ever did as a child, her movie preferences include foreign films, documentaries, and dark, moody movies with interesting characters (she absolutely cannot abide “chick flicks”). Anne is the mother of two sons, one of whom now has a degree in film and television (both of her sons like horror movies, for reasons she cannot fathom). She lives in Memphis, Tennessee. ← Afternoons at the movies with a dog named Spot. Love stories about Memphis–makes me think of Corky’s! Anyway, I think most southerners thought it was a big deal to see Gone with the Wind anytime it was re-released. Never knew Dave was such a movie fan! Bet you and your sisters received frequent “shushing” from him on movie trips.The “big, old theater in mid-town” was probably the Crosstown. “Fail Safe” may have played in the Studio, an “art” theater at one time on Highland, close by Brother Juniper’s. Lots of pleasant memories of Memphis in those days!